It is important to learn about how cannabis interacts with the human body and about the multitude of medicinal benefits that this plant can provide. This course covers the historical context of the word marijuana, describes the basic components of cannabis, and details the differences between indica and sativa plants. It also describes how the components in cannabis interact with receptors in the human body – receptors that when triggered can be beneficial for everything from pain management to improving memory. Marijuana vs Cannabis: What's the Difference? While both words have been used in relation to the cannabis industry, they each have distinct meanings, histories, and origins. To begin, there is no “marijuana plant.” There is a cannabis plant that as a whole or in part is sometimes referred to as marijuana¹. However, the term marijuana has consistently been used in a negative light since its inception. There is a consistent and ever-expanding list of health benefits (both proven and continually researched), and using the term cannabis is not only beneficial in changing public assessment – it is illustrative of the power of this plant, its historic significance, and the need to shed decades of misinformation. It is important that we work to continue to destigmatize cannabis and show how it can be beneficial for a myriad of medical conditions and ailments. That includes understanding that the misuse of terms impacts the industry negatively. ¹CBD Web. (2017). Hemp vs. Marijuana vs. Cannabis: What’s the difference?. [online] Available at: http://www.cbdweb.org/medical-cannabis-guide/hemp-vs-marijuana-vs-cannabis [Accessed 2 Oct. 2017]. ²Gettman, J. (2015). Marijuana vs. Cannabis: Pot-Related Terms to Use and Words We Should Lose · High Times. [online] High Times. Available at: http://hightimes.com/culture/marijuana-vs-cannabis-pot-related-terms-to-use-and-words-we-should-lose/ [Accessed 2 Oct. 2017]. ³Leafly. (2017). The Cannabis Taxonomy Debate: Where Do Indica and Sativa Classifications Come From? | Leafly. [online] Available at: https://www.leafly.com/news/cannabis-101/the-cannabis-taxonomy-debate-where-do-indica-and-sativa-classific [Accessed 14 Oct. 2017]. Further, cannabinoids occur naturally in the human body and interactions with cannabinoids from plants such as cannabis are what trigger various physiological actions.². ¹Aizpurua-Olaizola, O., Soydaner, U., Öztürk, E., Schibano, D., Simsir, Y., Navarro, P., Etxebarria, N. and Usobiaga, A. (2016). Evolution of the Cannabinoid and Terpene Content during the Growth ofCannabis sativaPlants from Different Chemotypes. Journal of Natural Products, [online] 79(2), pp.324-331. Available at: http://pubs.acs.org/doi/abs/10.1021/acs.jnatprod.5b00949 [Accessed 14 Oct. 2017]. ²Ligresti, A., De Petrocellis, L. and Di Marzo, V. (2016). From Phytocannabinoids to Cannabinoid Receptors and Endocannabinoids: Pleiotropic Physiological and Pathological Roles Through Complex Pharmacology. Physiological Reviews, [online] 96(4), pp.1593-1659. Available at: http://physrev.physiology.org/content/96/4/1593.long [Accessed 14 Oct. 2017]. There are over 100 unique cannabinoids in cannabis, but two of the most often referenced and well researched are delta-9-tetrahydrocannabinol (THC) and cannabidiol (CBD). THC, or THC dominant strains of cannabis, are associated with psychoactive experiences and effects, while CBD is not – however, both have powerful medicinal properties. Scientists and researchers now believe that the various components of cannabis have synergistic relationships with one another, meaning that they are more effective when utilized together than apart. This is known as the entourage effect⁹, and it is thought that together these compounds amplify the benefits of the plant. ¹Struwe, M., Kaempfer, S., Geiger, C., Pavia, A., Plasse, T., Shepard, K., Ries, K. and Evans, T. (1993). Effect of dronabinol on nutritional status in HIV infection. – PubMed – NCBI. [online] Ncbi.nlm.nih.gov (US National Library of Medicine National Institutes of Health, PubMed). Available at: https://www.ncbi.nlm.nih.gov/pubmed/8395916. ²Adelli, G., Bhagav, P., Taskar, P., Hingorani, T., Pettaway, S., Gul, W., ElSohly, M., Repka, M. and Majumdar, S. (2017). Development of a Δ9-Tetrahydrocannabinol Amino Acid-Dicarboxylate Prodrug With Improved Ocular Bioavailability. [online] US National Library of Medicine National Institutes of Health (PMC). Available at: https://www.ncbi.nlm.nih.gov/pmc/articles/PMC5389743. ³D.P. Sutherland. Effect of marijuana on Essential Tremor: A case report [abstract]. Mov Disord. 2016; 31 (suppl 2). http://www.mdsabstracts.org/abstract/effect-of-marijuana-on-essential-tremor-a-case-report. ⁴Nguyen, C., Krewenka, C., Radad, K., Kranner, B., Huber, A., Duvigneau, J., Miller, I. and Moldzio, R. (2016). THC (Δ9-Tetrahydrocannabinol) Exerts Neuroprotective Effect in Glutamate-affected Murine Primary Mesencephalic Cultures Through Restoring Mitochondrial Membrane Potential and Anti-apoptosis Involving CB1Receptor-dependent Mechanism. Phytotherapy Research, [online] 30(12), pp.2044-2052. Available at: http://onlinelibrary.wiley.com/doi/10.1002/ptr.5712/abstract. ⁵Hammell, D., Zhang, L., Ma, F., Abshire, S., McIlwrath, S., Stinchcomb, A. and Westlund, K. (2015). Transdermal cannabidiol reduces inflammation and pain-related behaviours in a rat model of arthritis. European Journal of Pain, [online] 20(6), pp.936-948. Available at: https://www.ncbi.nlm.nih.gov/pmc/articles/PMC4851925. ⁶Schier, A., Ribeiro, N., Coutinho, D., Machado, S., Arias-Carrion, O., Crippa, J., Zuardi, A., Nardi, A. and Silva, A. (2014). Antidepressant-Like and Anxiolytic-Like Effects of Cannabidiol: A Chemical Compound of Cannabis sativa. CNS & Neurological Disorders – Drug Targets, [online] 13(6), pp.953-960. Available at: https://www.ncbi.nlm.nih.gov/pubmed/24923339. ⁷Devinsky, O., Cross, J., Laux, L., Marsh, E., Miller, I., Nabbout, R., Scheffer, I., Thiele, E. and Wright, S. (2017). Trial of Cannabidiol for Drug-Resistant Seizures in the Dravet Syndrome. New England Journal of Medicine, [online] 376(21), pp.2011-2020. Available at: http://www.nejm.org/doi/full/10.1056/NEJMoa1611618. ⁸Cannabis Use in Palliative Oncology: A Review of the Evidence for Popular Indications. (2017). [ebook] Haifa, Israel: The Israel Medical Association Journal: IMAJ, p.3. Available at: https://www.ima.org.il/FilesUpload/IMAJ/0/228/114215.pdf. ⁹Ben-Shabat, S., Fride, E., Sheskin, T., Tamiri, T., Rhee, M., Vogel, Z., Bisogno, T., De Petrocellis, L., Di Marzo, V. and Mechoulam, R. (1998). An entourage effect: inactive endogenous fatty acid glycerol esters enhance 2-arachidonoyl-glycerol cannabinoid activity. European Journal of Pharmacology, [online] 353(1), pp.23-31. Available at: http://www.sciencedirect.com/science/article/pii/S0014299998003926?via%3Dihub [Accessed 14 Oct. 2017]. The endocannabinoid system (also known as ECS) is a group of endogenous cannabinoid receptors located throughout the human body, in places like the brain, the central and peripheral nervous systems, connective tissues, organs, glands, and immune cells. It is involved in processes in the human body such as appetite, pain-sensation, mood, and memory¹. It has been called “the body’s own cannabinoid system”² and is directly concerned with the homeostasis³ of the human body⁴. ¹Aizpurua-Olaizola, O., Elezgarai, I., Rico-Barrio, I., Zarandona, I., Etxebarria, N. and Usobiaga, A. (2017). Targeting the endocannabinoid system: future therapeutic strategies. Drug Discovery Today, [online] 22(1), pp.105-110. Available at: http://www.sciencedirect.com/science/article/pii/S1359644616302926 [Accessed 14 Oct. 2017]. ²Grotenhermen, Franjo (23 Jul 2012). “The Therapeutic Potential of Cannabis and Cannabinoids”. Dtsch Arztebl Int. 109 (PMC3442177): 495–501. PMC 3442177 Freely accessible. PMID 23008748. doi:10.3238/arztebl.2012.0495. ³Melamede, R. (2005). Harm Reduction Journal, [online] 2(1), p.17. Available at: https://harmreductionjournal.biomedcentral.com/articles/10.1186/1477-7517-2-17 [Accessed 14 Oct. 2017]. ⁴Bermudez-Silva, F., Cardinal, P. and Cota, D. (2011). The role of the endocannabinoid system in the neuroendocrine regulation of energy balance. Journal of Psychopharmacology, [online] 26(1), pp.114-124. Available at: http://journals.sagepub.com/doi/abs/10.1177/0269881111408458. Cannabinoid receptors are a part of the endocannabinoid system, along with the enzymes that synthesize and degrade endocannabinoids¹. ¹Mackie, K. (2008). Cannabinoid Receptors: Where They are and What They do. Journal of Neuroendocrinology, [online] 20(s1), pp.10-14. Available at: https://www.ncbi.nlm.nih.gov/pubmed/18426493 [Accessed 14 Oct. 2017]. ²Matsuda LA, Lolait SJ, Brownstein MJ, Young AC, Bonner TI (1990). “Structure of a cannabinoid receptor and functional expression of the cloned cDNA”. Nature. 346 (6284): 561–4. PMID 2165569. doi:10.1038/346561a0. ³Gérard, C., Mollereau, C., Vassart, G. and Parmentier, M. (1991). Molecular cloning of a human cannabinoid receptor which is also expressed in testis. Biochemical Journal, [online] 279(1), pp.129-134. Available at: https://www.ncbi.nlm.nih.gov/pmc/articles/PMC1151556/ [Accessed 14 Oct. 2017]. What are the Differences Between Endocannabinoids and Phytocannabinoids? Endocannabinoids have been described as the body’s natural THC. Endocannabinoids and the endocannabinoid system are a group of cannabinoid receptors located throughout the brain and central and peripheral nervous systems. Studies involving endocannabinoids have been pivotal in revealing that cannabinoids act as neuromodulators for motor learning¹, appetite², and pain sensation³, among other processes. ¹Kishimoto, Y. (2006). Endogenous Cannabinoid Signaling through the CB1 Receptor Is Essential for Cerebellum-Dependent Discrete Motor Learning. Journal of Neuroscience, 26(34), pp.8829-8837. ²Di Marzo, V., Goparaju, S., Wang, L., Liu, J., Bátkai, S., Járai, Z., Fezza, F., Miura, G., Palmiter, R., Sugiura, T. and Kunos, G. (2001). Leptin-regulated endocannabinoids are involved in maintaining food intake. Nature, 410(6830), pp.822-825. ³Cravatt, B., Demarest, K., Patricelli, M., Bracey, M., Giang, D., Martin, B. and Lichtman, A. (2001). Supersensitivity to anandamide and enhanced endogenous cannabinoid signaling in mice lacking fatty acid amide hydrolase. Proceedings of the National Academy of Sciences, 98(16), pp.9371-9376. ⁴Aizpurua-Olaizola, O., Soydaner, U., Öztürk, E., Schibano, D., Simsir, Y., Navarro, P., Etxebarria, N. and Usobiaga, A. (2016). Evolution of the Cannabinoid and Terpene Content during the Growth ofCannabis sativaPlants from Different Chemotypes. Journal of Natural Products, 79(2), pp.324-331. Indica and sativa are the two most commonly recognized types of cannabis plants. Both have their own unique and comprehensive range of medicinal effects. Indica strains have widely been used to assist with promoting rest and alleviating anxiety, and have been effective in treating muscle spasms and tremors (for example those caused by multiple sclerosis and Parkinson’s Disease¹). ¹Medicaljane.com. (2017). 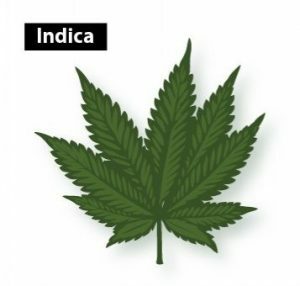 About Cannabis Indica | Medical Marijuana 101 Overview. [online] Available at: https://www.medicaljane.com/2013/07/25/cannabis-indica-as-explained-by-medical-jane/ [Accessed 14 Oct. 2017]. ²Zuardi, A., Crippa, J., Hallak, J., Moreira, F. and Guimarães, F. (2006). Cannabidiol, a Cannabis sativa constituent, as an antipsychotic drug. Brazilian Journal of Medical and Biological Research, [online] 39(4), pp.421-429. Available at: http://www.scielo.br/scielo.php?pid=s0100-879×2006000400001&script=sci_arttext [Accessed 14 Oct. 2017]. ³Iuvone, T., Esposito, G., Esposito, R., Santamaria, R., Di Rosa, M. and Izzo, A. (2004). Neuroprotective effect of cannabidiol, a non-psychoactive component from Cannabis sativa, on beta-amyloid-induced toxicity in PC12 cells. Journal of Neurochemistry, [online] 89(1), pp.134-141. Available at: http://onlinelibrary.wiley.com/doi/10.1111/j.1471-4159.2003.02327.x/full [Accessed 14 Oct. 2017]. ⁴Ware, M., Wang, T., Shapiro, S., Robinson, A., Ducruet, T., Huynh, T., Gamsa, A., Bennett, G. and Collet, J. (2010). Smoked cannabis for chronic neuropathic pain: a randomized controlled trial. Canadian Medical Association Journal, [online] 182(14), pp.E694-E701. Available at: http://www.cmaj.ca/content/182/14/E694.short [Accessed 14 Oct. 2017]. ⁵Leaf Science. (2017). Indica vs. Sativa: What’s The Difference? – Leaf Science. [online] Available at: https://www.leafscience.com/2017/10/16/indica-vs-sativa-whats-difference/ [Accessed 24 Oct. 2017]. What Do Indica Plants Look Like? Indica plants tend to be shorter and have denser branches, with broad and short leaves. Because the leaves are wider, they often overlap each other. In addition, their leaves darker in color because of higher amounts of chlorophyll. What Do Sativa Plants Look Like? 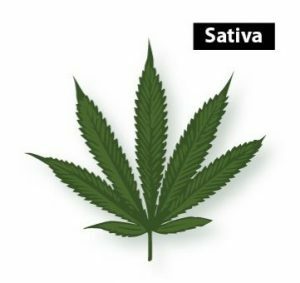 Sativa plants are tall and thin, with wider spaces between branches and long, narrow leaves. When flowering, sativa plants have the potential to be significantly taller than indica plants.